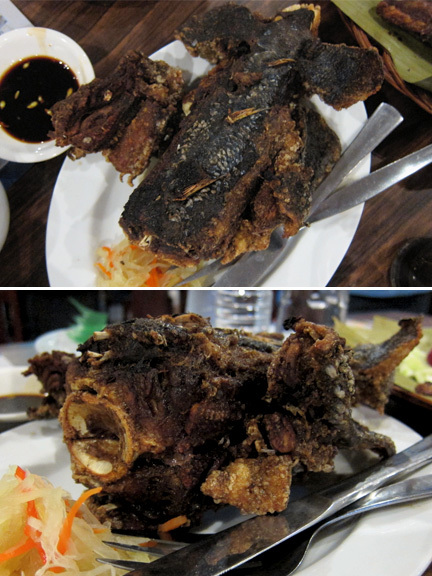 After landing in Davao City just last week, our very first dinner was set at Marina Tuna Seafood Market & Restaurant. This is said to be one of the best places to get tuna fresh as the owner owns the largest tuna fishing fleet in Davao and is also a major exporter of tuna and seafood. Marina’s quite known for their “10 Ways to Enjoy Tuna”; with pictures of various preparations plastered all over the restaurant walls. It’s not really a degustation type of thing but more or less a showcase of dishes you can have aside from (or on top of) the typical sinugba (grill). 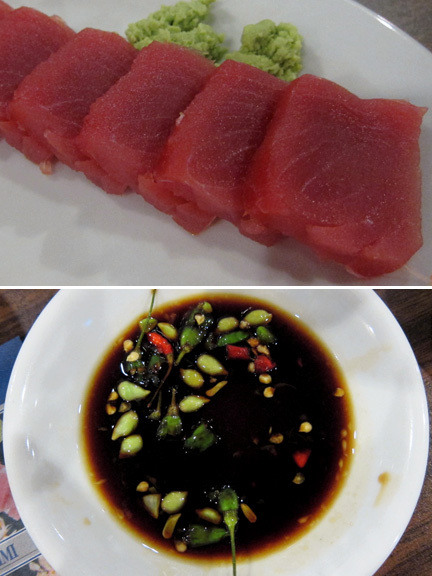 You can select what to have from the list but we decide to try almost everything; nine out of ten of the tuna dishes. And so here’s the rundown of the gauntlet. 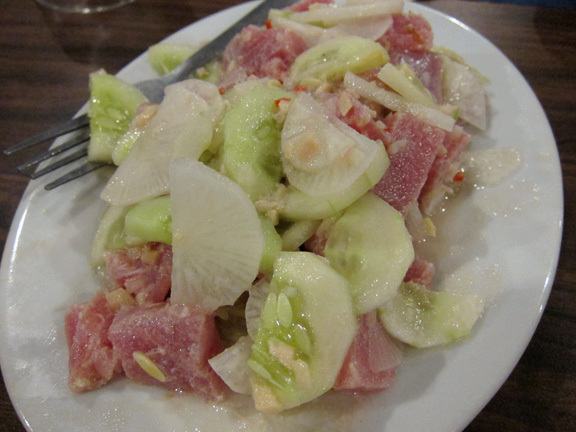 Tender, translucent sashimi with Davao style dipping sauce. First up: sashimi. It wasn’t really hamachi or even a fatty part of the belly like otoro. In fact it looked like a pretty lean cut. But freshness plays a big part in that it was so tender and just melted in the mouth. A Davaoeno host sitting beside me made a dipping sauce from crushed labuyo, kalamansi and soy sauce and I loved it. We also had the compulsory orders of grilled tuna belly and panga (collar). The panga is actually my favorite part of the tuna because of the unctuous, full-flavored meat but they did a pretty good job of grilling the belly as well. It wasn’t dry and rubbery and I was continually picking on it. When in Davao, you have to have kilawin. They serve it everywhere in the city and I don’t recall ever not liking one. Marina’s is also pretty standard. And I mean that in a good way. Just the right acidity, saltiness and perfect amount of ginger to just counter, if any, fishiness. The primary flavor is that of the fish. The tuna eye soup is somewhat of an acquired taste. 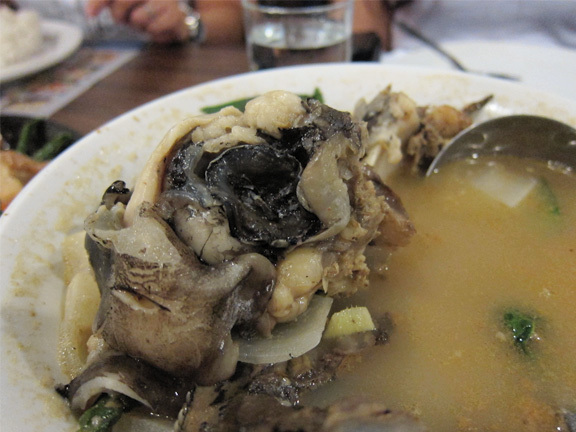 At first I thought it would be like a gruesome bowl of floating eyeballs; but it was, in fact composed of about a massive quarter of the fish head, that included the eye socket, boiled in a sinigang flavored broth. The eyeball was as big as an orange. I’m quite an adventurous eater but I backed down from this one. The soup alone was extremely fishy (malansa), which is typical because of the fish part used. But our hosts tell me that a different paksiw-style preparation tempers the fishiness. So will probably try that out on my next visit. The crispy tuna tail was excellent. It’s the spinal segment just before the tail-fin and is deep-fried whole. It actually looks like a crispy pata, and does in fact, have similarities. The skin crisps up like chicharon, and beneath lies the tender flesh along with gelatinous cartilage and tendons. Again, perfect with the chili-soy dipping sauce. Tuna tendons. Still undecided on this one. 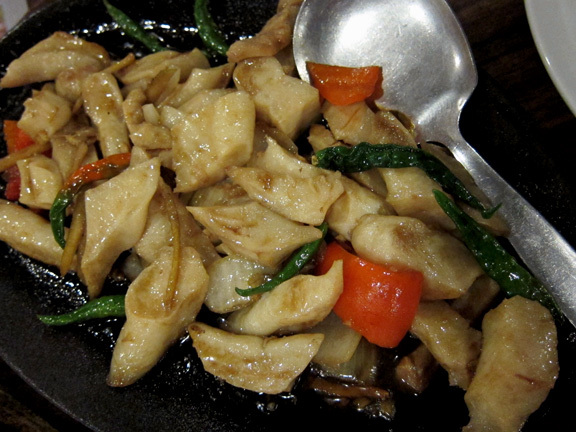 The sizzling tuna tendon (ubol-ubol) was interesting. It came with a sweet-salty brown sauce topped with chilies. I can’t say it has a lot of flavor but it’s probably more a texture food. Somewhat toothy, like cuttlefish. I liked their version of preparing bagaybay. I’ve tried this grilled and it usually comes out a bit tough and chewy. But with the same sweet-salty brown sauce on hot plates, the bagaybay remained tender with just a touch of springiness. Again, more a texture food and took on most of the sauce’s flavor than anything. Bagaybay, by the way, is the male tuna’s sperm sacs. These are must orders. Bihod on left and bagaybay on right. 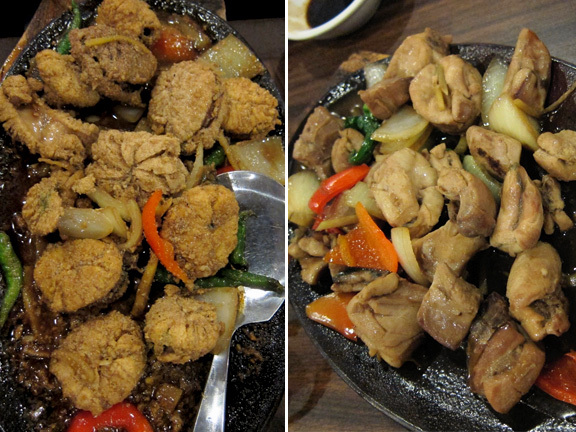 Among three dishes served on sizzling plates, I liked the bihod the best as it had a rich savory flavor. Very similar to balut, I suppose, as it is the female tuna’s egg sacs. The same part they use to make bottarga. The last three dished are supposedly aphrodisiacs. Just saying. Not that I felt anything different. The soup. I see you! I do remember ordering a plate of adobong kangkong as opposed to the tenth tuna dish they had; which was kare-kare. It was really nothing extraordinary, but a plate of vegetables does wonders to clear one’s conscience of carnage. We had no more room in our bellies for sweets and just ended the meal with some pomelo. And now that we had checked tuna off our list over this Davao welcome dinner, we rolled out the door seeking our beds. Marina also offers seasonal seafood catches on the menu but that will have to wait for the next visit.